I like to be around pretty stuff. That can be a nice apartment, nice clothes or nice people. For me, the way the room I'm staying in looks, can really make my day. When the city of Hamburg started building a new part of town in a discarded harbour area, a new subway line came with it. And to my delight, they decided to make it special, to create a space, that makes people happy on their commute to work or on their way to the supermarket. 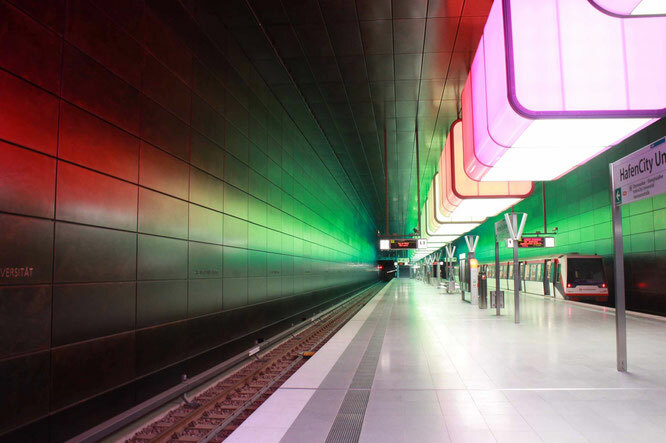 The first stop to open was “Hafencity universität”, a place bringing a whole new meaning to the word subway station. 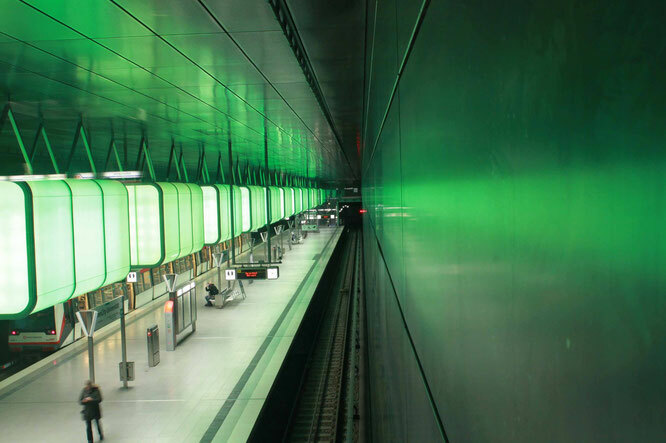 walls reflect the colourful light, surrounding the passengers with an impressive light show. The light is slowly altering from one colour to another, every time changing the room's atmosphere completely. The station's architecture was designed and realized by Raupach Architekten while Pfarré lighting design and Stauss Grillmeier Design (all from Munich) contributed the light installation. On weekends and holidays on full hours between 11am and 6pm, a special 10 min show is being staged. The lights inside the cubes “dance” to the sound of classic music, changing colours quicker and individually. Even if you can't make it to the show, this installation is worth seeing! Have you found any special subway stations anywhere in the world? Please let me know in the comments, it looks like I've found a new obsession! 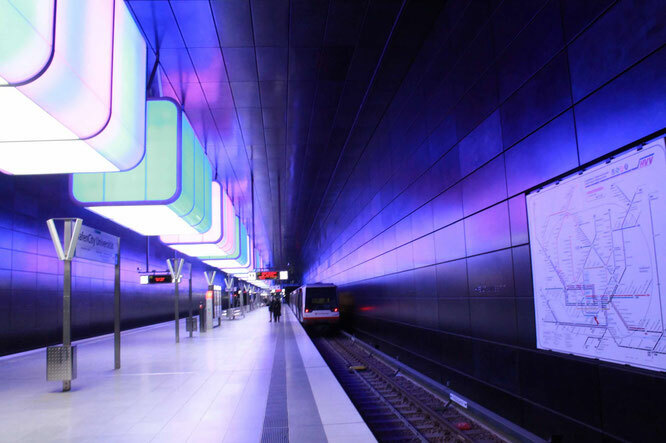 Take the U4 to "HafenCity Universität"
Lovely light installation! I went to the subway station at the hafen city, it's really worth seeing even without music show. Thanks for the tip! you're welcome, Valerie. Happy to hear that you enjoyed it! I have visited city of Hamburg. It was pleasure visiting it. My siblings and I were visiting beautiful destinations late at night. It was simple amazing! Gary Halbert was a great copywriter when someone comes to him plus says something like this, he suggests to first basic education in advertising principles to start with. I have gone to city of Hamburg. It was joy going by it. My kin and I were going to delightful goals late around evening time. It was basic stunning! Gary Halbert was an awesome marketing specialist when somebody comes to him in addition to says something like this, he recommends to first fundamental training in promoting standards to begin with. More remote away is Pearl Harbor, the USS Arizona Memorial, and the Battleship USS Missouri Mighty Mo, the ship where the arrangement finishing WWII was agreed upon. More distant still are the North Shore.